It’s kitchen reveal day! I can’t even tell you how excited we are about the end results! And, I can’t wait to share all of the details with you today! In an effort to not be redundant with readers that have followed the whole journey, I’m just going to jump into the finished space. But, if you’re new here, or haven’t been around for the entire journey (or just want a refresher), I’d encourage you to check out any of the below linked posts for the whys/hows/etc. of this renovation. I struggled with how much detail to include on this post. I didn’t want to include too much and bore you all, but I also didn’t want to leave a lot of unanswered questions or unknowns. 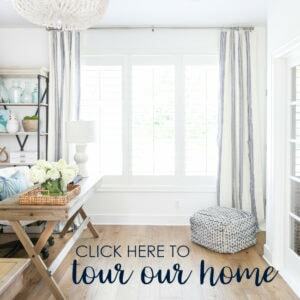 There were other small projects we tackled during this renovation in our living room, dining room and entryway, but I plan to share those separately in the coming weeks and just focus on the kitchen today! My thought is that I can plan a follow-up FAQ kitchen post to include some additional photos, as requested, and provide details to items I may have missed the first time around! I’ve also included a master list of sources and vendors at the end of the post for items I may not mention along the way. This post contains affiliate links for your shopping convenience. A big thank you to Caesarstone and Serena & Lily for providing me with some of the product used in this makeover. Click here to read my full disclosure policy. So, let’s get right to the before and after! The before picture was taken about six years ago, the first time we walked through the house with our realtor. It’s hard to believe it’s even the same home now! From day one when we made an offer on the house and ultimately purchased it, we knew our plans would be to renovate the kitchen. We had actually planned to do it several times over the past few years, but one thing or another led us to push it off. Which worked well, because it allowed for us to save for a bigger renovation than we had originally anticipated! We’re are ecstatic about the end result. We were going for a classic coastal kitchen vibe. Knowing this is our forever home, we wanted the base elements to stand the test of time and look good 20+ years from now. We kept the trendier items (like the light pendants) limited to items that are easy changes down the road. Let’s dig further into some of the details. If you read through the series of kitchen posts I have linked above, you can see that initially we had looked into painting our prior kitchen cabinets. But since they were thermofoil (and several were peeling or bubbling), we were advised to not paint. We then were planning to just have new doors built. But, after meeting with McClains Custom Cabinets, we found that it was only another $1,000 or so to go fully custom. Rather than having to build everything at our house and paint here, they could build everything in their shop, paint from there and then simply install at our house which made for some serious savings! To say we are happy with the cabinets would be a major understatement. The craftsmanship they demonstrated was unreal and I couldn’t be happier with how they were built or installed! We went with a simple shaker style cabinet with x-details on the ends of the island and on four of the upper cabinets. I love the clean and classic look! 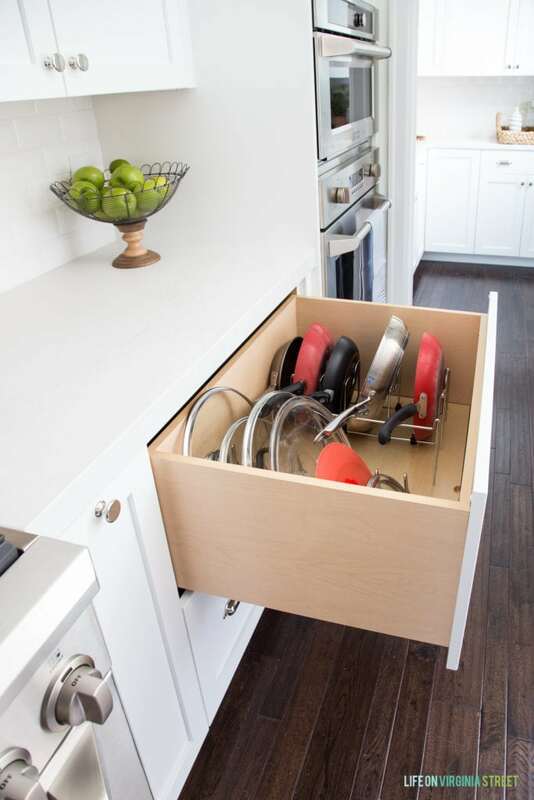 One of the best parts of custom cabinetry is that there is zero wasted space. There are no filler pieces and you can essentially design each spot in your kitchen how you want it! The custom range hood is one of my favorite new features. 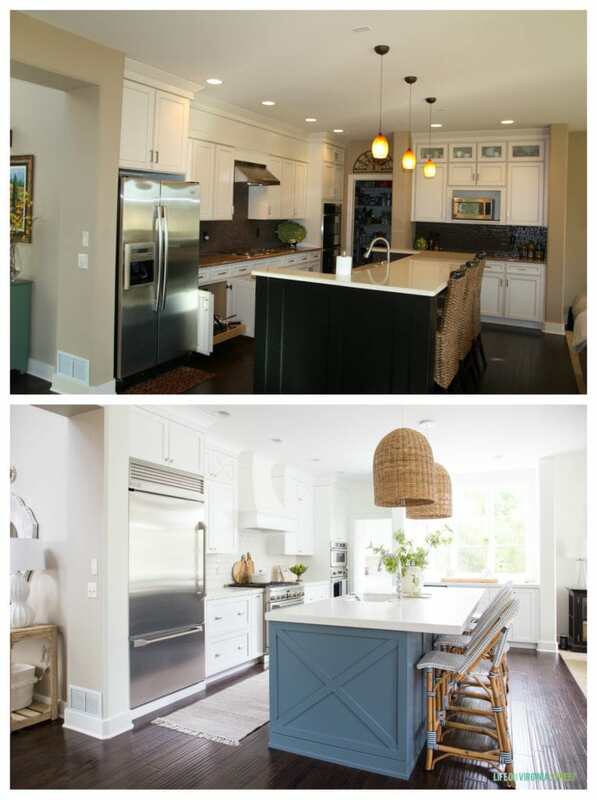 Erica and I stalked a lot of kitchens so we could share inspiration photos with McClain’s. It’s exactly what I had envisioned and I couldn’t be happier with it! You’ll notice we also mimicked the x-detail from the island on the upper four cabinets as well. One of the non-negotiables was easy access to our garbage can and recycling bins. Since we went from a cooktop stove to a full range, we lost the spot for our garbage (previously under the cooktop). 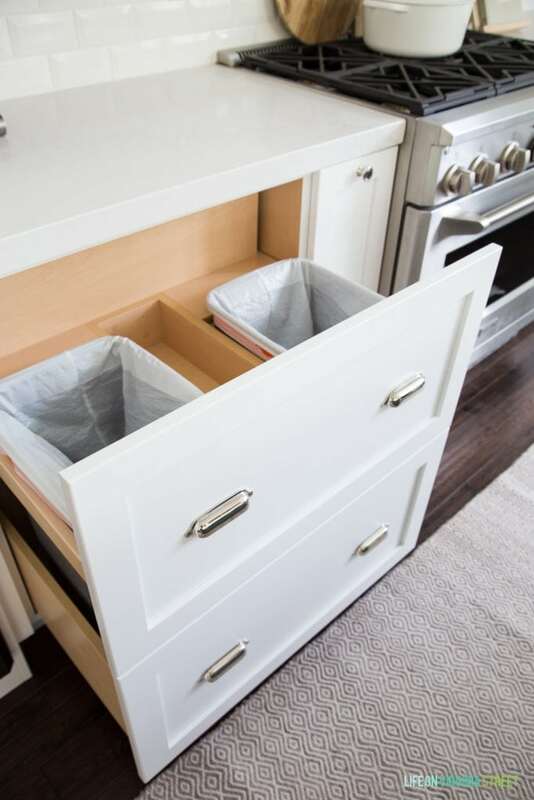 We wanted to keep this wall symmetrical, so the only option was to make the garbage drawer wider than necessary and make it look like drawers (which I love)! It was McClain’s idea to add the garbage bag holder in the center to utilize the extra space! On either side of the range, we had “spice rack” drawers built in. 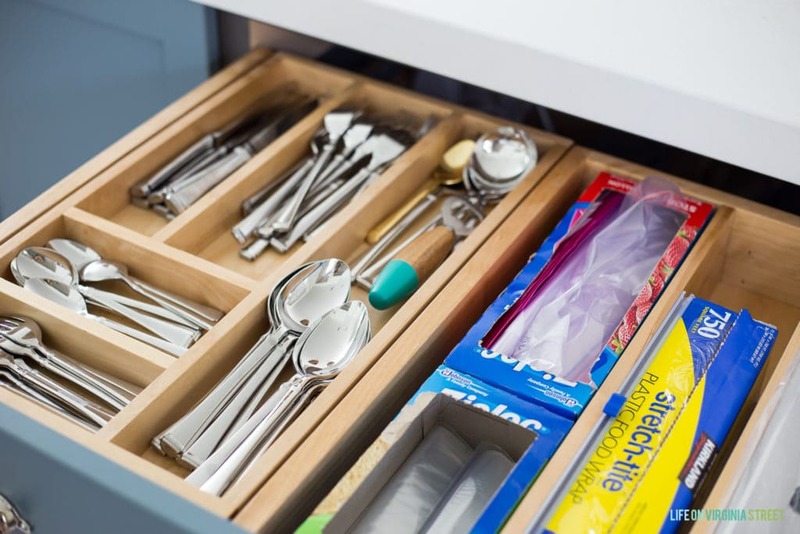 One pull-out drawer is actually a utensil organizer for spatulas, tongs, etc. 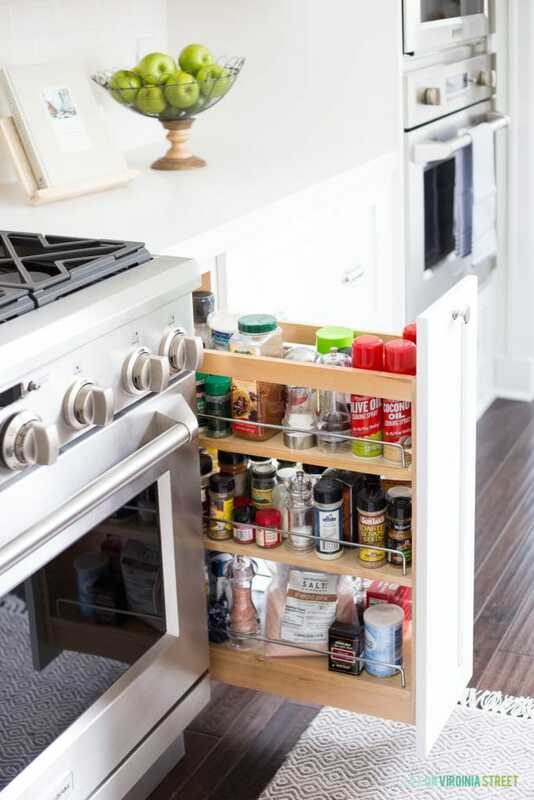 The other pull-out drawer holds our spices and seasonings. Neither are organized all that well yet, but we actually do know where everything is! The guys at McClain’s were able to use Rev-A-Shelf products and then built custom front panels to match the rest of our kitchen! The drawers on the right of the spice rack house our pots and pans on top and our mixing bowls and other cooking items below. 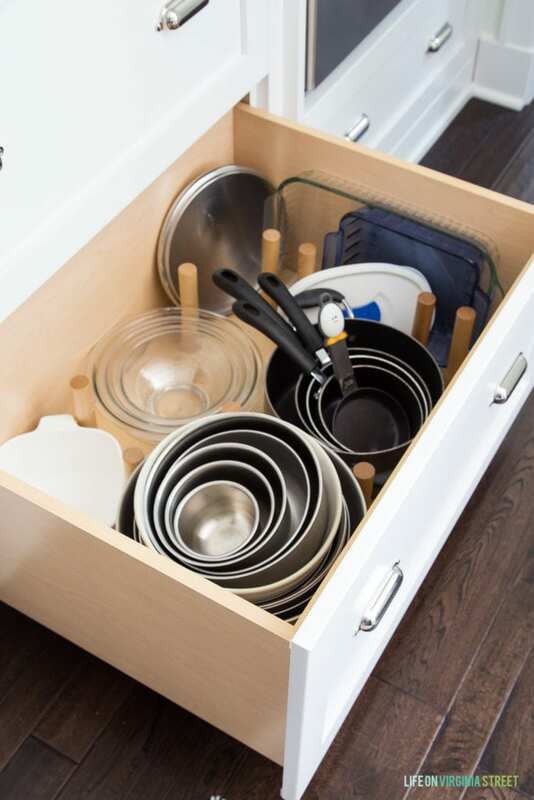 The drawers essentially have peg boards laying flat and then metal dividers on top and wood pegs below that stick into the holes to keep the pans and skillets all aligned. It’s pretty slick! I want to give a major shout out to McClain’s Cabinets. They were a dream to work with, and as I mentioned above, their craftsmanship is top-notch. If you’re in Omaha or surrounding area, I can’t recommend them enough!! The island is our punch of color in the room! We chose Benjamin Moore Providence Blue and it has turned out to be the perfect shade! It looks really dark blue in some lights, blue-green other times of day, and bluish-gray at other times. I love that it’s a chameleon! The new island is actually about 18″ longer but about 8″ less wide than our prior island. Essentially the size of a full slab of quartz with an allowance for the 2″ mitered edges. It made such a difference to lower it all to one level and ultimately makes the room feel so much larger! Not only that, it gives us a few more inches of clearance between the barstools and living room. We also had room to had a small drawer and cabinet on the left-hand side of the dishwasher with the new design! 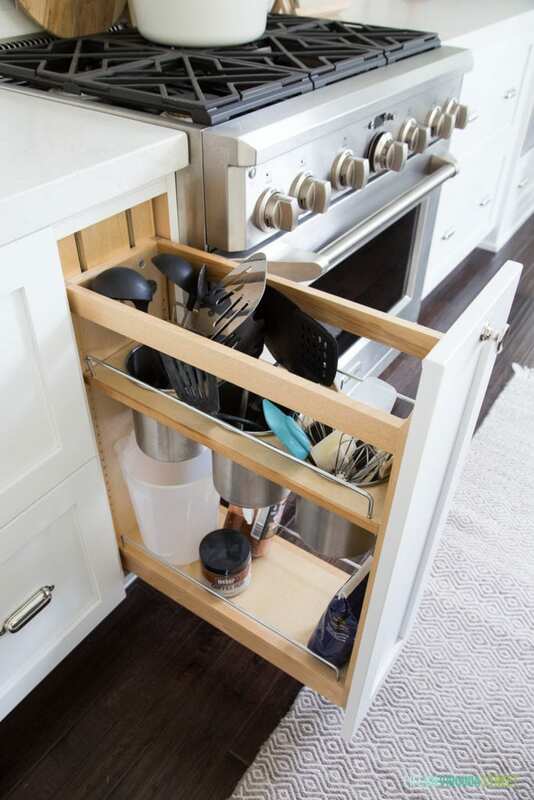 One of our favorite features in the top island drawer is this double-tiered sliding cutlery/silverware tray. The left side holds all of our everyday silverware. The right hand side is perfect for Ziploc bags, saran wrap, etc., and has a built-in tin foil holder/cutter. 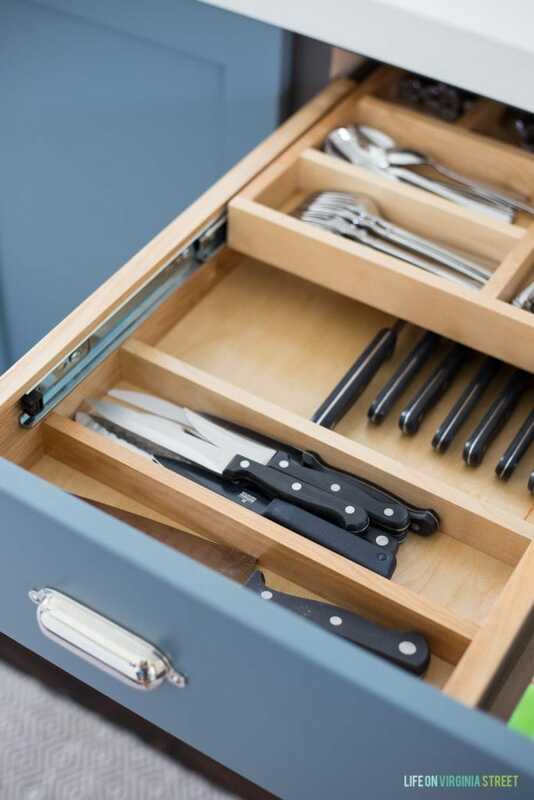 You can the slide the silverware tray back to reveal our knives and a built-in knife block! All of these items used to take up three full drawers, so we love that we can hold it all in one! Although we lost multiple overhead cabinets with the new design, we actually have just as much, if not more, storage space! The entire back side of the island now has shelf storage behind six cabinet doors that look like board and batten trim! 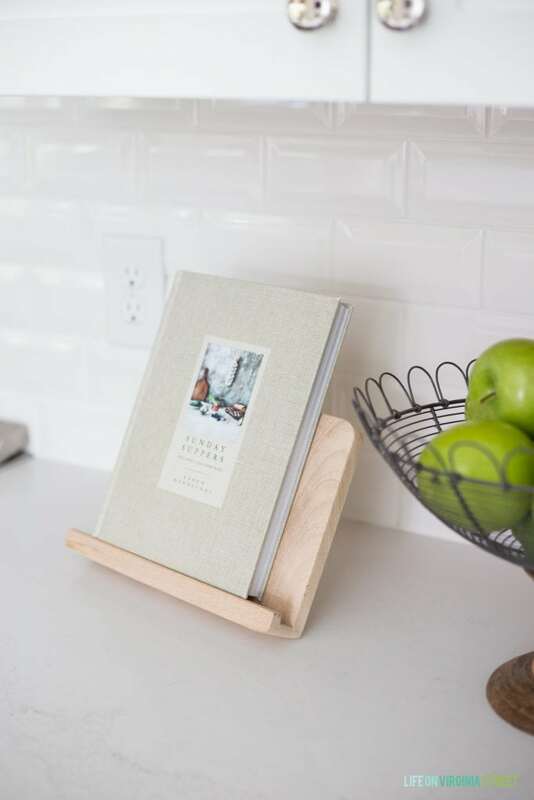 It’s the perfect spot to store seasonal dishes and other items we don’t need on a daily basis. I went back and forth on whether or not I should do an apron front farmhouse sink. In the end, I didn’t want the bright white apron to detract from the blue island, so we went with a single basin sink. So far we love it! But it’s definitely an adjustment going from stainless steel to white cast iron. 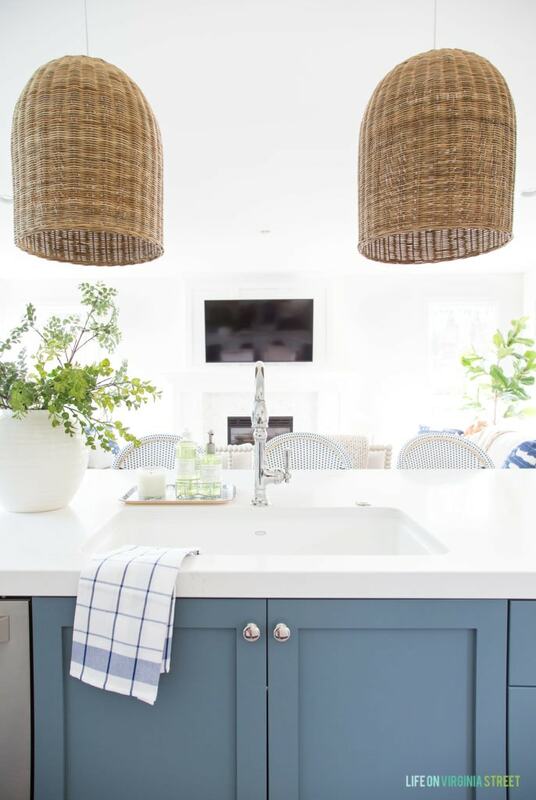 The island pendant lights and bistro counter stools (c/o Serena & Lily) add the perfect amount of warmth to all the blue and white tones. 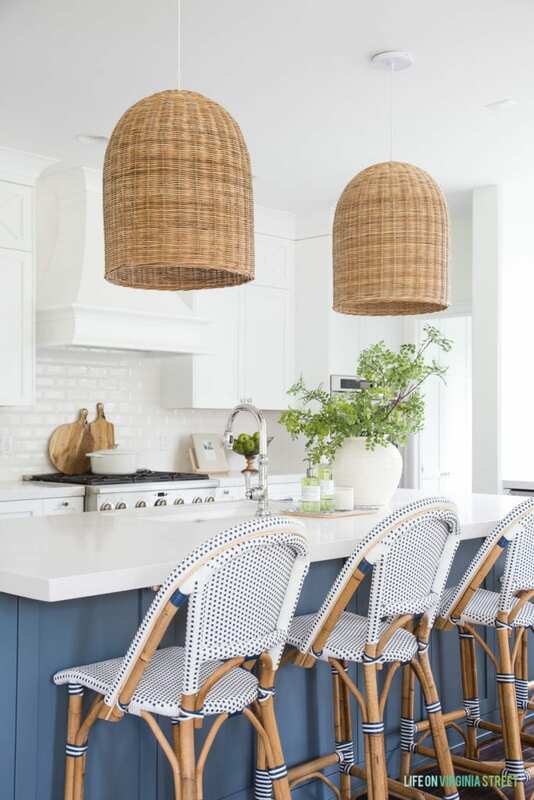 They completely finish the space and add that coastal vibe we love so much! 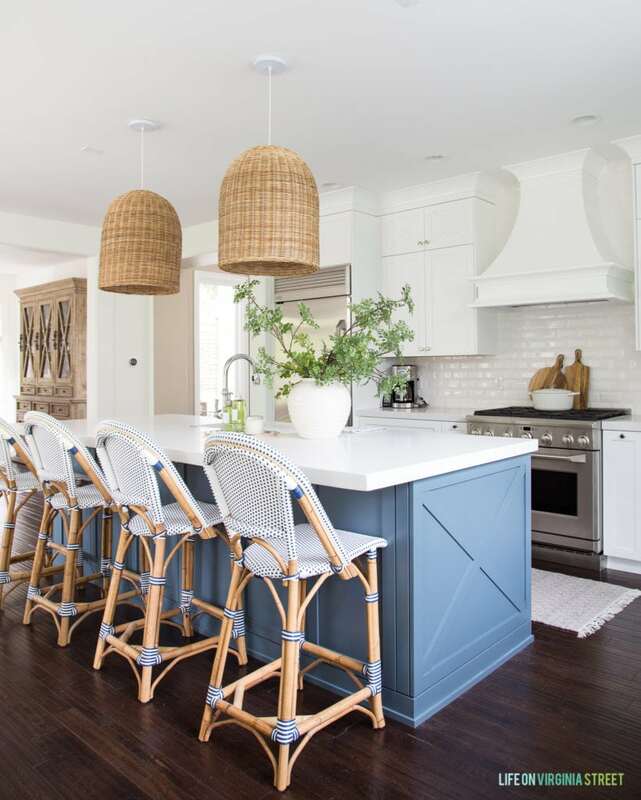 And, since our island was slightly lengthened and the form wide legs removed, we were able to add a fourth bar stool to the space, which was our ultimate goal. 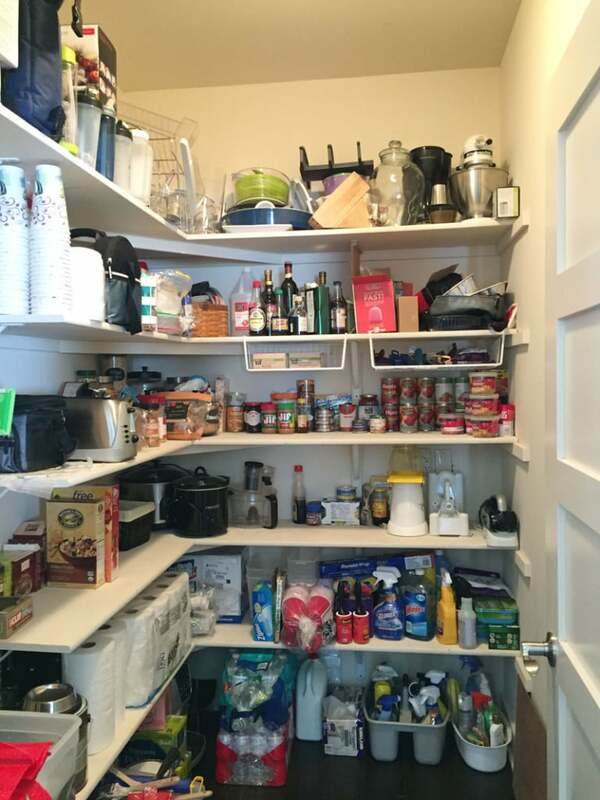 The pantry was previously one of the most terrifying spaces in our kitchen. Now, it’s one of our favorites! Here’s a peek at how it used to look (and this was after we had cleaned and organized it). And here’s how it looks now! Cabinets are a beautiful thing when you are not the most organized people! This room is one of our favorite updates of the whole project (have I already said that about every feature?). Kurtis is actually the one that pushed hard for full cupboards. I had initially wanted only lowers and then open shelving above. But then he reminded me how well we do with open shelves. Plus…cats. So, although the room isn’t big at all, we moved forward with full cabinetry and countertops. The tall locker-style cabinet to the left holds our broom, hardwood vacuum, mops, etc. It juts outs slightly which makes it perfect for Kurtis to store all his crap he used to leave out on the counters. Items like his waffle maker, protein powders, oatmeal, etc. that he uses every day to make his breakfast. He can now leave it out hidden behind that cabinet and we’re both happy campers! In lieu of lazy susans in the corner cabinets, the doors open on the left side and bend in half to reveal the entire corner cabinet inside. It works great to store our small kitchen appliances on the lower level, and large baking canisters in the upper portion. 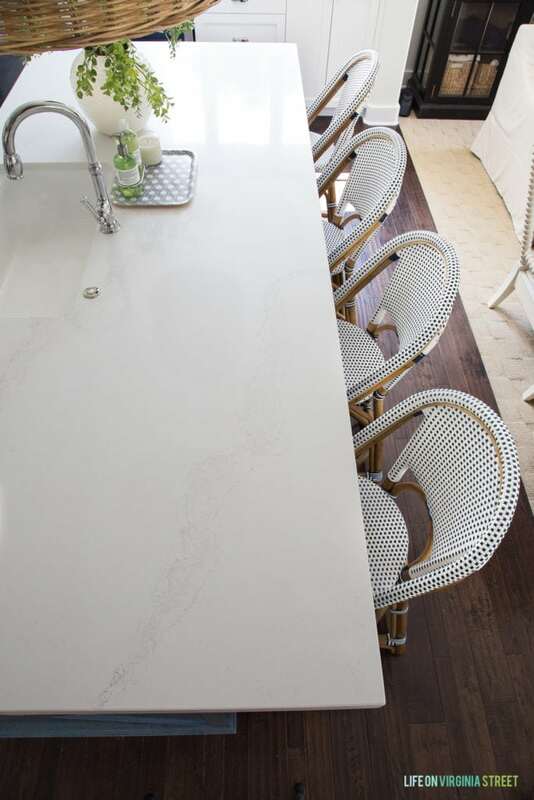 We ultimately decided on Caesarstone’s Calacatta Nuvo quartz for our countertops and it’s the perfect choice for us! The background appears white (although it’s a super soft warm gray) and there is subtle gray and beige veining throughout. I initially wanted Carrarra or Calacatta marble, but we ultimately decided it was just too big of a risk. I love that this quartz is super durable (no sealing required!) and it has the bright look I love but still with interest in the veining. You can read more about our selection process here (although we have a few years of searching for the perfect countertops in the archives). I want to make note that, only once we did a lot of research and ultimately picked this quartz, did I reach out to Caesarstone to see if they wanted to partner. They provided the slabs to us, and we then paid all fabrication costs. We opted to have our fabricator do a 2″ mitered edge on all of the kitchen counters. However, with the pantry, we opted to leave those at standard height. Second to the windows, the countertops are the hardest to photograph and really get an accurate representation of their color (their site has great details shots here). You can see some of the subtle veining detail in the bottom left of the photo above and then the warmer overall tone compared to the backsplash and cabinets. 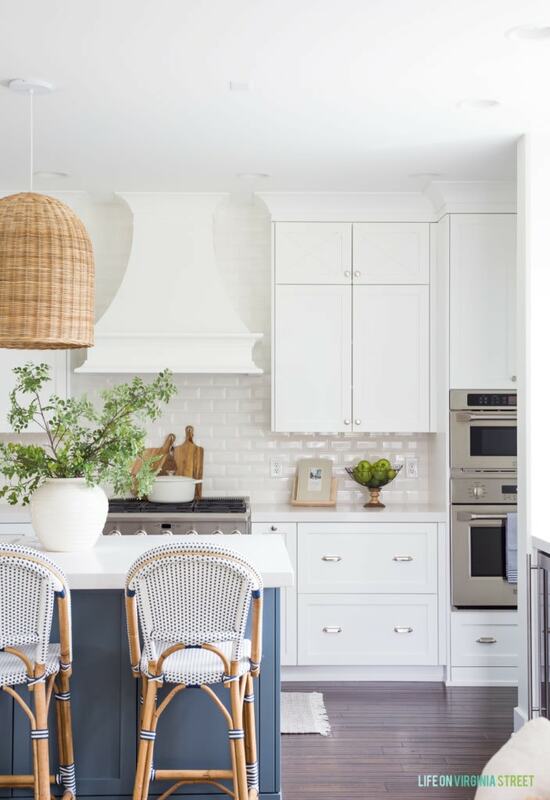 The Simply White cabinets are the lightest and brightest, then the beveled subway tile (which has a warm tone too), followed by the countertops. Below I took a darker photo from overhead so you could see some of the detail on a bigger slab. The lighter countertops are a bit more work than our dark quartz we had previously (the windows is partly responsible for that). But, as I like to remind Kurtis, at least we know they’re always clean this way. Our old dark countertops were probably hiding scary things 😉 We both agree they’re the perfect color with the perfect amount of veining though! The windows were one of the most dramatic changes in the renovation. We previously didn’t have a window in the kitchen or pantry, which is odd for a house that has windows on 2-3 walls in every single room on the main level! Add in black cabinets, dark brown tile backsplash and countertops, and it always felt rather dark compared to every where else in our house. Now the light streams in and we love it so much! This little area serves as our entertaining center. We have the beverage fridge, tumblers for the pool, wine glasses, etc. Our goal is to ultimately move all of our wine glasses and liquor/wine over here so that we can take the wine glass racks and bar cart out of the dining room. Getting back to the window, this one is massive at 60″x70″. Kurtis had major reservations about it, but I think he’s secretly as obsessed as me. We designed it to match the front office window with the horizontal grids. The pantry window was one we almost nixed to save on costs, but it has completely change the pantry for the better. I think without it, it would have felt like a closet in here, and now it’s a space we want to look at all the time! The windows are probably the cats’ favorite update. Anything that gives them more sunlight for them to lay in is a game changer in their minds! Just pretend you don’t see the Japanese beetle spray on the windows that Kurtis accidentally over-sprayed outside a few weeks ago 😉 This photo gives a better picture of the true colors we see outside though from the window. I love the injection of so much greenery! This entire process went so much more smoothly thanks to the help of Erica from Erica Bryant Design. I had an overall vision for the space, but she knew how to execute the details and work with all the tradesmen to get it done! She dealt with hiring, scheduling, etc. which made this process move so quickly. Because she handled most of the details, I don’t have info on some of the companies we worked with, but she scheduled it all (cabinets, counters, electricians, tile setters, carpenters, plumbers, etc.). Everyone she hired for the job did excellent work and were very friendly. She was amazing to work with and we would highly recommended her! I hope you’ve enjoyed this reveal and following along this journey with us! Thank you for all of your support! 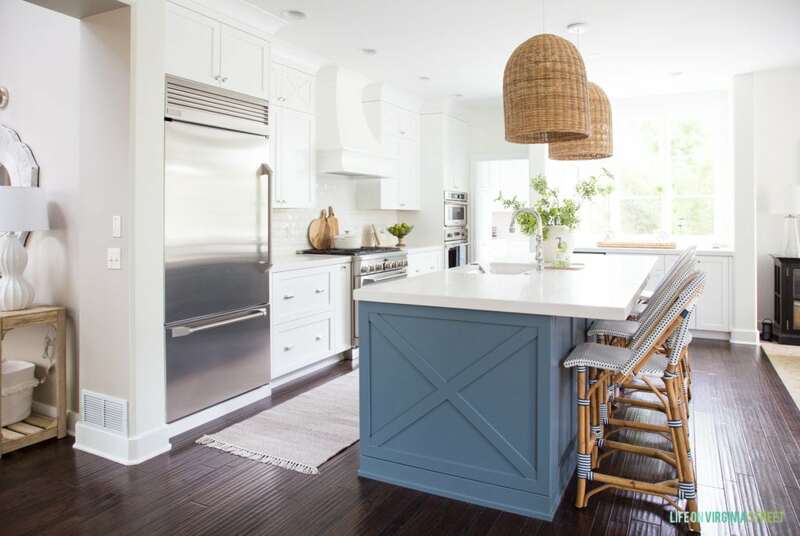 If you’re looking for even more kitchen details, be sure to also check out my Coastal Kitchen Remodel FAQs for answers to some of the most frequent questions that came up on this post! Absolutely beautiful! The extra windows have made all the difference, you can barely tell it’s the same room. I am in love with all your design choices. Your kitchen is very beautiful! I love all of your selections. Can you tell me how deep the cabinets are in your pantry? I’m considering adding cabs to our pantry also, which is currently just shelving similar to what you had before…but I’m wondering how deep the cabs should be. This is so, so good. Beautiful and functional and so perfect. The new windows give me life… even all the way here in Minnesota. Thanks for letting us follow along! It is STUNNING. 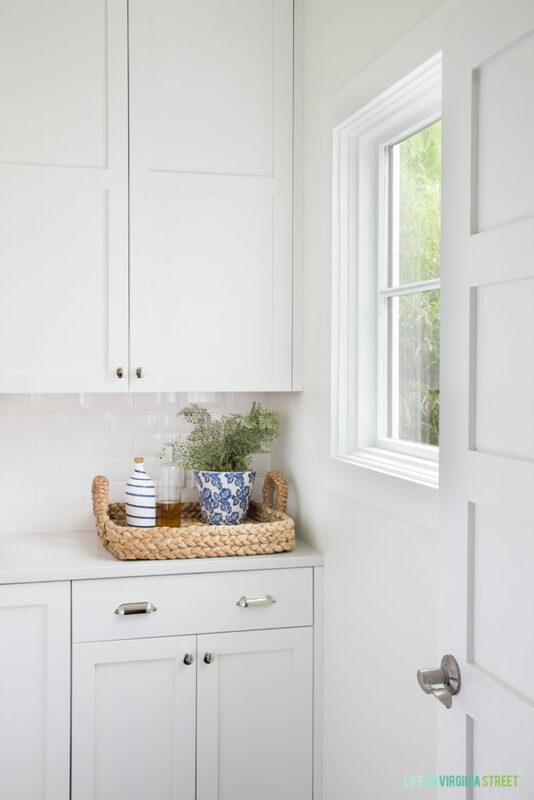 I love the addition of the windows, they make such a difference and your cabinet design is gorgeous. Love that range hood too. The pantry is a dream, you did such a great job on your renovation. It truly is gorgeous. Wow Sarah, wow! I’ve been waiting and this did not disappoint! You are making lots of people jealous out there! Every inch is perfection but I think my favorite is the pantry cabinets! What a transformation! Sarah! It is so perfect! I absolutely love all of your choices. Beautifully done, my friend! You guys have to be loving your new space!! I love it Sarah! It’s hard to believe it is the same space. The windows make all the difference in the world and the colors you selected could not be more perfect! Amazing transformation!!!! Sarah. I’m still picking my jaw up off the floor. An absolute dream!! So, so amazing. 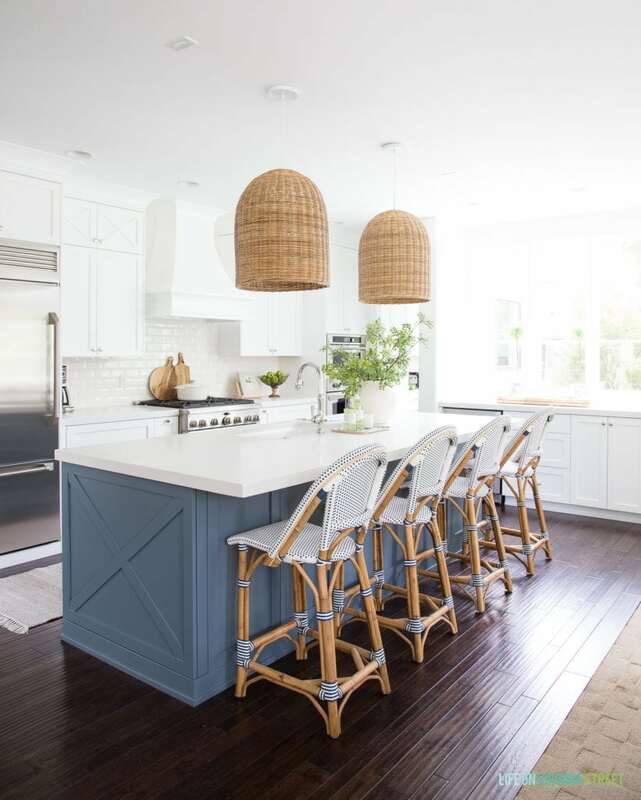 The pendant lights and bar stools are the perfect on trend additions to a classic and gorgeous design that will last you years! I love EVERYTHING! What a lovely reveal! Looks like a page out of the Serena & Lily catalog–or a brochure for the Hamptons! I enjoy your blog immensely. Beautifully done Sarah! I hope you are enjoying it! Now I can’t wait for mine to be finished!! Wow! Your pantry is amazing. We have a 7 foot walk-in pantry that mirrors your “before” photo so this gives me major inspiration! The window in it adds so much! 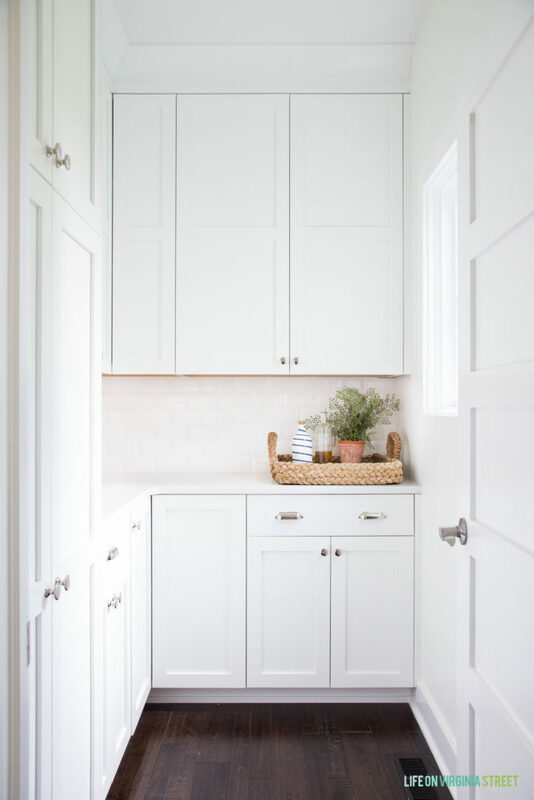 We can’t add a window because it is an interior room, but I love the idea of having cabinetry instead of open shelving because real life is not a Pinterest post. Now it is! I love your vent hood and your pendants. Everything is beautiful and can’t wait to see your fireplace makeover. Sarah this turned out beautifully! I cannot get over that pantry AND the windows! Sarah every inch is absolutely beautiful. What a genius idea to add the windows. It’s so bright and gorgeous. And the pantry is perfection. Well done, my friend. Well done! Enjoy this amazing kitchen. 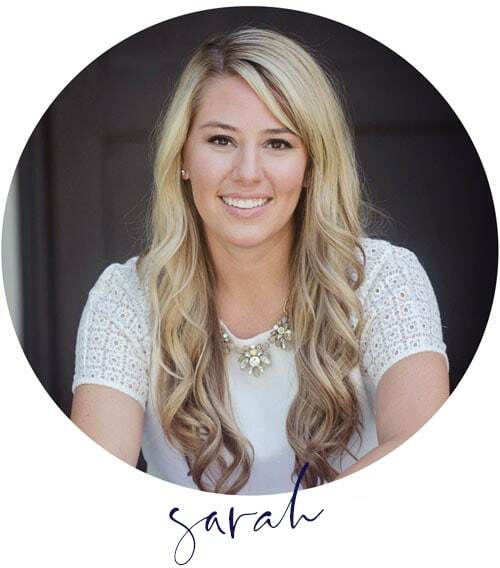 Sarah, I couldn’t wait to see this reveal because your new layout and design elements are so similar to plans we have for our kitchen remodel. I knew you would make beautiful decisions on all the finishes and it is every bit as gorgeous as I expected!!!! The new window and all that natural light is glorious, and I adore your pendant lights, island color, countertops and your styling! Love love love it all!!! You have an amazing new space and I’m sure you will enjoy it for years! WOW! the new windows bring in some much light into the kitchen. love it all! will you please do a post/review about the kitchen appliances? love the look of the fridge! we are shopping around for our remodel sometime this fall? Thanks and everything turn out so beautiful! In your next walk around your kitchen, could you post photos of the island cabinets? Actually all the cabinets opened? This is an amazing transformation! The window was the best addition! Gosh, Sarah! I can’t even get over what a transformation this is! The window really made such a difference. I’m glad you ended up adding the window to the pantry as well. My favorite view is that one looking towards the pantry and you can just see all of that light! Well done, my friend!! It’s gorgeous! Beautiful! This is one of the prettiest kitchens I have seen! I can’t even pick a favorite part because I love it all. The window makes a world of difference and makes all your other choices stand out so much more. Love it! I thought this was going to be one of those wow reveals. But this more of a holey moley totally amazing reveals! From the moment you mentioned knocking out windows in your kitchen and pantry, I was hooked. It has paid off! Stunning space with the perfect amount of styling. I love it. You should be so proud. I hope you enjoy every minute of it!! Your new kitchen is amazing! From the new island to the new pantry and appliances. Please take more pictures next time of the cabinets open in the pantry and the island. OHHHHHMMMMMGEEEEEE I love it! When can I move in? Love your kitchen, the brightness, the windows, how neat and inviting, great job!! Stunning transformation!! Love LOVE the window additions and that awwsome pantry! Sarah it is absolutely gorgeous!! Your vision for this space was incredible and you have truly outdone yourself! Gorgeous pantry and those windows too! And the blue!! I love it all so much! Enjoy!! Your kitchen is the stuff dreams are made of! It truly stopped me in my tracks. I am so incredibly jealous, girl! Awesome reveal! Love it all! I’ve been working on a smaller version of a kitchen upgrades (butlers pantry, counter top, paint) so it’s been so helpful to see what you did. Could have used your help on a wine cooler! lol That was a lot of research. I was curious about your pantry door and what you would do. That is a problem for us: large entry, door can’t swing out into kitchen area or into pantry. Café door, 5 lite. Enjoy! Hello, I absolutely love your pantry makeover. I’m thinking of doing the same in my pantry. Would you mind sharing the dimensions of your pantry? My pantry looks to be about the same size so I’m wondering if my pantry would be large enough for the cabinets, etc. Thanks for any information you can share about your pantry dimensions. Just gorgeous! The window makes all the difference!! Wow, Sarah!!! You totally killed it here! This is absolutely drop dead gorgeous! This space is headed straight for the pages of a magazine! Oh Sarah!!! It is perfect! I love how the windows let in all that extra light now!!! Now I’m going to research custom cabinet makers around here… great tip!!! Sarah, you’ve outdone yourself! This is crazy beautiful! And practical! How often do you say that together? Yes, it’s gorgeous (the stools, lamps, and ooooh the light from those windows! ), but as a pragmatic person, my favorite things are things like your counter (already put on the short list for the future dream kitchen) and those drawers. Brilliant my dear. I wish you many wonderful meals and fun times in your beautiful new kitchen! Stunning! I would love to see some more details about the inside design of the pantry cabinets – in particular the corner cabinet. I SOOO want to replace the lazy susan cabinet in my kitchen. My favorite part is the silverware/knife drawer!! It’s been so much fun to follow along on this entire adventure. I love how you shared so many behind the scenes of all of your design choices. Every detail is gorgeous. I’m so excited for you. Sarah, you knocked it out of the park! Every little detail… I’m so jealous of your window and hood and organizer pullouts and pantry and…. haha! I just know you are going to love being in here for years to come. INCREDIBLE! What color grout did you use for the backsplash? Is it white or a very light grey? What a beautiful space. I love the B.M. color you chose for the island. We’re building a house and I am considering doing my island in blue or gray…. 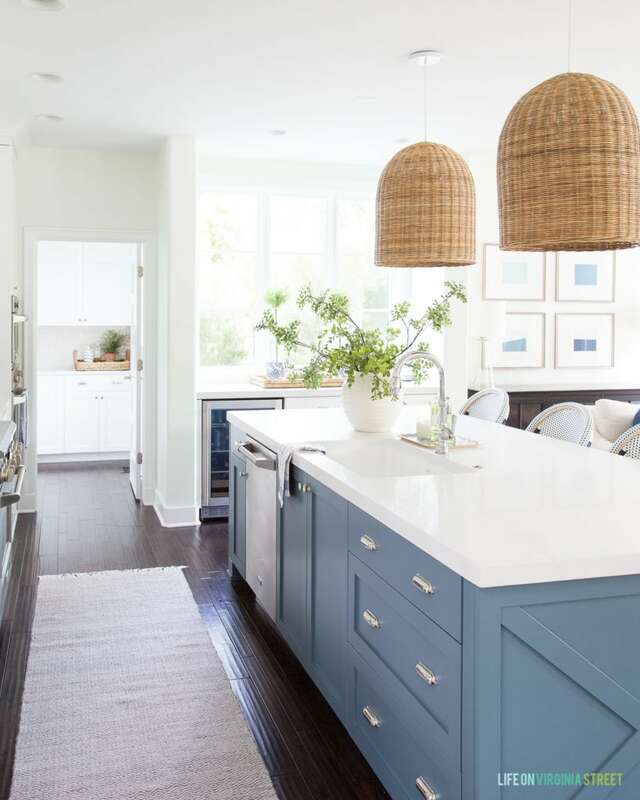 your kitchen is totally scoring a vote for the blue side. Stopping by from the before/after link up! Thank you so much Laura! And good luck with your new build! Beautiful kitchen! Is this the grey or earth seaview runner? Thank you! Thank you! Mine is the Earth color!